Apropos of the latest Archdruid report, I went in search of some data on the geographic distribution of long-term income growth in the US. 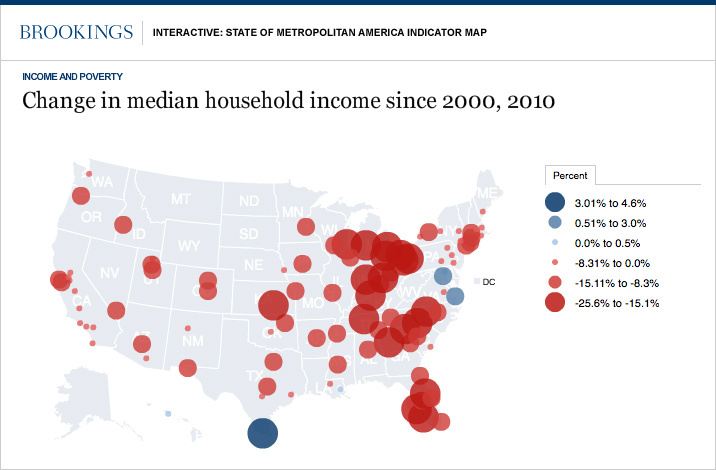 So far, the most useful thing I found is this Brookings Institute interactive map. 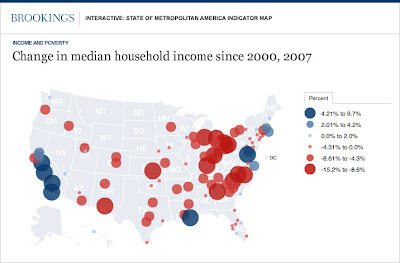 It's not exactly what I'm looking for but the above shows the change in median household income 2000-2010 by metropolitan area. That's a pretty bleak looking map isn't it? There's hardly anywhere in the country that ordinary folks improved their lot over the last decade. Still - some places are worse than others with the midwest and upper south and Florida being hardest hit. Across these areas, median income declined 15-25%: that's a really dramatic change in material standard of living. It's also worth noting that it's even worse than it looks in the sense that the blue circles are on a quite different scale than the red circles. You can see that the pain in the midwest was already severe (and was going on well before 2000) but was considerably worsened by the recession (check the difference in map scale). The pain in California and Florida is largely since the housing bust. The Archdruid puts the end of progress down to the end of cheap energy. I'm inclined to give a minor role to the end of cheap oil since 2005 (coal is still incredibly cheap) but think that most of the red on the map is due to the effects of globalization on the US industrial regions, and on income inequality generally - globalization benefits the managers and owners of global corporations while hurting ordinary US workers (and benefitting Asian workers). It's also worth noting that the reference year (2000) was the height of the tech bubble. Where I agree with the Archdruid is that it's rather hard to see how this turns around in the next decade. What I'd like is a map of the age of the pain - how long ago did median household income peak in each region? That's a great visualisation, Stuart. It's a little superficial to blame globalization, though. As you say, some people have done well, while others have done worse - the rural population of China is now very poor compared to the urban population, for instance. The failure has been one of distributing the benefits. It's not intrinsic to globalization.